Millefiori means "a thousand flowers". These beads have been made since the 15th century, although it was not until the early 19th Century that they were widely made. 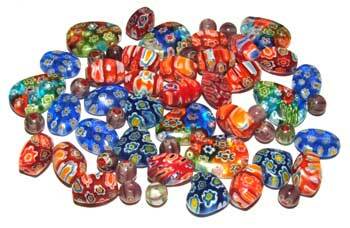 There are thousands of different designs of Millefiori beads There are two stages in making a Millefiori bead. The first stage involves making a cane. The mosaic slices or chips of this cane (which are called murrine), are then sold to the bead maker who places the chips onto a wound glass core, and produces a wonderful bead. Gorgeous Dark Blue Hearts with Yellow and White Flowers. These beads are approx. 12mm x 12mm. They have a hole from top to bottom. Packet of 10. Cute Light Blue Millefiori Coins with White and Red Flower These beads are approx. 10mm. Packet of 10.